Last night it unexpectedly began to snow…and snow and snow. This morning we were shrouded in a foot of soft, white silence. Trees bowed under the weight, bent almost double, forming arches and bowers. Power cables and phone lines stretched to within a couple of inches of Robert’s head. Huge wet snowflakes fell, fell, fell. The dogs are beside themselves with snow excitement. ...and this afternoon we bring out the snow plough! This afternoon we dig ourselves out with the help of the trusty bobcat. Half a mile of steep lane needs to be cleared. 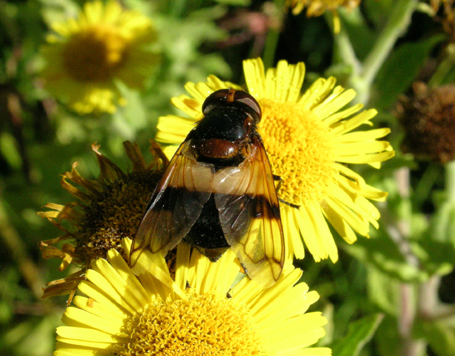 Hoverfly Volucella pullucens live in bee and wasp nests feeding off debris and scavenging dead and dying insects. I don’t know if you’ve ever noticed an insect hovering around flowers that you presume is a bee or wasp, but on closer inspection something is just not right? No pollen sacks? No sting? 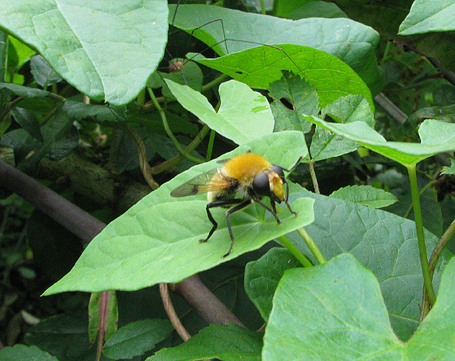 Most probably it’s a hoverfly. Arctophila superbiens - the water filled hoof print one! Robert, as you may have gathered, has a keen interest in moths and bumble bees, but this year due to the awful weather they have done very badly. So unfortunately his numerous mothing and bee finding forays have been total washouts and he’s returned home empty handed and despondent. However during these expeditions he’s noticed that the hoverfly has actually done rather well; so the frustrated entomologist in him has found an alternative outlet – identifying and photographing hoverflies. 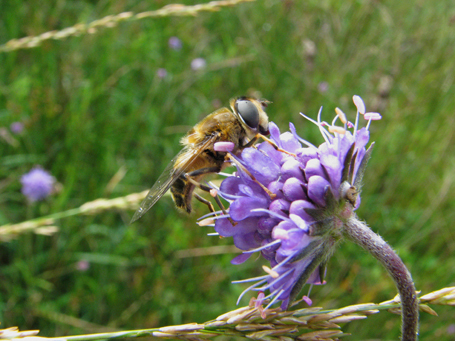 Hoverflies, as their name suggests, are known for their hovering abilities. Many of our 250 British species are brightly coloured, mimicking bees and wasps. Although they themselves are quite harmless, having no sting, by this ruse they gain some protection from birds and other predators. The adults are abundant on flowers for much of the year, feeding on both pollen and nectar, while the larvae live in rooting wood, compost heaps, stagnant water and so forth feeding largely on decaying organic matter. A few, like Volucella pellucens, live in the nests of bees and wasps, scavenging dead and dying insects and other debris. And another, the Arctophila superbiens’ larvae, live in water filled hoofprint along shady muddy paths…no brownie points for knowing why this particular insect has thrived this year! Not a hoverfly in sight! 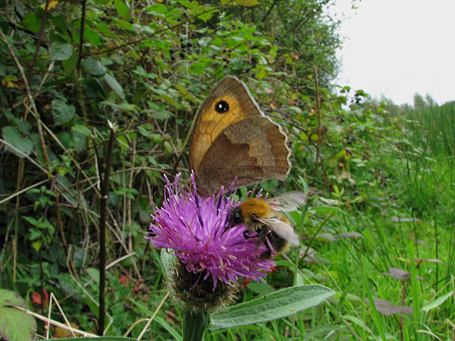 A meadow brown butterfly and carder bee nectering on knapweed. 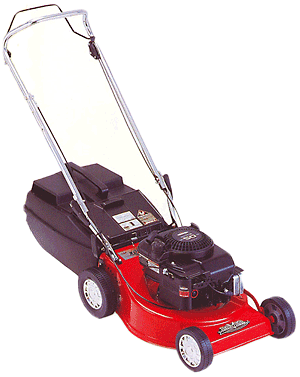 I’ve just bought a lawnmower. Rushed out rashly and squandered good money on a macho no-nonsense red-muscle machine that will cut in the rain! Why? Yesterday I was trying to get a myriad of things done before today’s forecasted rain and mowing the lawn (a bit too grand – grass, weeds and moss more like) happened to be one of them. I’ve been a bit worried about our trusty old mower just lately; black smoke, rusted through decks, coughing, hiccupping, limping – that sort of thing. Not without cause, so it seems, as yesterday it died. After valiantly spluttering into life, petering out, yet nobly starting again, it rattled, smoked and choked around the back garden and when the last blade was cut with a ghastly death rattle it stopped – forever. No soothing glugs of reviving oil or intervention with major surgery (of lump hammer kind) would bring it back to life. It was dead, knackered to death…as Robert so sensitively put it. But what was I to do? I had over half the grass still to cut. It has grown like blazes with all the rain. Though I’d managed a kind of uneven trim during a surprise rain storm last week, left yet another week I would need to use the tractor and agricultural topper. “Buy another one?” said Oll, hammers and spanners hanging limply from his hands. So this morning off Olly and I went down to Devtrac, our local farm machinery (with garden mowers) store, to see what John could offer us. The rain had arrived already. Busy getting ready for the Okehampton show John was nevertheless more than willing to give us a run down on the stock. It was a sure sale! We hummed and hahed over the exact same but very latest model, looked at the next size up, wondered about choices of steel or alloy decks, pushed, lifted, scratched heads. Then I spied one at the end of the long display rack. “Cuts in the rain?” says I, listening to it pounding on the tin roof. “I know. But this is one good machine; changeable blades, good engine, variable speed, huge washable grass box …” he goes on about its virtues, but I’ve stopped listening, I’m thinking hard and fast. And yes, you can guess, it’s more than I wanted to pay. A dilemma. It’s what we want, well, except for the weight though my in-the-prime son has no problem with that. So, you know the outcome, conscience wrestled with, girly treats down the pan and one ‘hard’ lawnmower in the back of the truck. I cut the grass, in full waterproofs with the rain slating down…and yes, it did pick up all the grass! And, last but not least, it cuts stones…family joke about my mowing obsessions!